Illinois has already won more games in 2018 than it did all of last year when the Fighting Illini ran past Rutgers by 21 points on the road. The Illini are now 3-2 overall and the triumph over the Scarlet Knights ended a 13-game losing streak in the Big Ten Conference. Prior to Saturday, the last conference victory for Illinois came over Michigan State in November of 2016. The key against Rutgers was a commitment to the ground game that produced a pair of 100-yard rushers and the Illini defense forcing turnovers. Illinois picked off three passes against Rutgers, including the first pass attempt of the game, and now has 10 interceptions in five games. Northwestern: The Wildcats ended their three-game slide by improving to 2-0 on the road and knocking Michigan State out of the Top 25 for the second year in a row. QB Clayton Thorson had four total touchdowns (3 passing, 1 rushing) and Northwestern head football coach Pat Fitzgerald picked up victory No. 50 in the Big Ten Conference. Baylor: Kicker Connor Martin had a brutal day for the Bears until it came time to kick the winning field goal. Martin, who had already misfired on three field goals and an extra point, provided Baylor with victory No. 4 this season by nailing a 29-yard field goal in the closing seconds to knock off Kansas State. 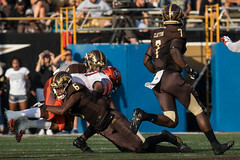 Princeton: From the start of the second quarter when it was a 7-7 game, Princeton scored on eight of its next nine drives to run away from Lehigh. The FCS nationally ranked Tigers posted a single-game school record 733 yards of total offense and improved to 4-0 overall. Davidson: The Wildcats moved to 5-1 overall and won back-to-back conference games for the first time since 2007 by holding on to edge Jacksonville. That same year, 2007, was also the last time Davidson won at least five football games in a season. The Wildcats posted more than 300 yards rushing again and scored six of the first seven times they had the ball. NC State: Powered by a running game that totaled a season-high 225 yards, the Wolfpack remained unbeaten by jumping out to a 28-3 lead before holding off a late Boston College rally. NC State is 5-0 for the first time since 2002 when Phillip Rivers was the quarterback and the Wolfpack started 9-0. 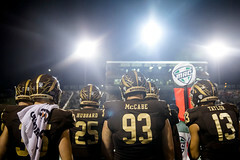 Western Michigan: Sparked by a defense that produced three sacks, eight tackles for losses and a critical turnover, WMU held on to edge Eastern Michigan on homecoming. The Broncos have won four in a row after starting the season 0-2. Notre Dame: The Fighting Irish continue to move up in the polls – now No. 5 in the country – after running away from Virginia Tech in the second half on the road. Notre Dame outscored the Hokies 28-7 the final 30 minutes and is now right in the center of college football playoff discussions. Colgate: The nationally ranked Raiders cruised to 5-0 overall behind a defense that has not allowed a touchdown in four consecutive games. James Holland Jr. had a pair of touchdowns and QB Grant Breneman threw for a season-high 254 yards to power the Colgate offense. Clemson: Travis Etienne, Lyn-J Dixon and Adam Choice each eclipsed the 100-yard rushing mark on only 10 carries to power a Tigers offense that rolled up 471 yards on the ground – the most under head coach Dabo Swinney. The Tigers averaged 11.8 yards per carry, breaking the previous school record of 11.2 set in 1903 against Georgia Tech. Penn: The Quakers coughed up a 24-0 lead, then put together a clinching 8-play, 87-yard drive in the dying minutes to come-from-behind and knock off Sacred Heart on the road. Karekin Brooks rushed for 191 yards on 28 carries to pace a ground game that churned out 364 yards. This entry was posted in Baylor, Clemson, Colgate, Davidson, Illinois, NC State, Northwestern, Notre Dame, Penn, Princeton, Rare Disease Awareness, Uplifting Athletes, Western Michigan. Bookmark the permalink.